Among eye conditions you might see in a furry family member is the all too common cataract. You’ve likely met a four-legged friend with clouded eyes, and if you have, you’ve already seen cataracts. They’re characterized by opaque eye lenses and usually occur because of genetic inheritance, injury, or diseases such as diabetes. Oftentimes when we think of cataracts, we think of blindness, but cataract development doesn’t necessarily equate to blindness. If cataracts occupy less than 30% of the lens or if only one lens is affected, they rarely cause diminished vision. When the opacity covers about 60% of the total lens area then visual impairment is usually apparent. Naturally, if the opacity progresses to 100% of the lens, the pet in question would be considered blind. Luckily, there are some risks that can be mitigated and preventative measures you can take to ensure your pet’s visual health and happiness. We mentioned above that genetics are a risk factor for cataracts. Some breeds are admittedly more prone to cataracts than others, such as the Labrador Retriever, French Poodle, Boston Terrier and the Welsh Springer Spaniel, to name a few. 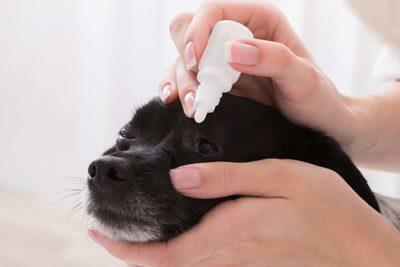 Should your pet develop cataracts, veterinary ophthalmologists can actually treat them with surgery in certain cases, so you will want to ensure your pets are getting regular checkups. This way, you and your vet can identify problems promptly and arrange referrals quickly. If you adopt a pet who already has cataracts, you can consult your veterinarian about surgical options during the initial exam. Should you seek a pet from a breeder, you’ll want to find out whether or not the breeder has participated in any eye disease screening or certification programs, which allow breeders to check for diseases within their breeding stock! In addition to genetics, disease and injury can cause cataract development. Untreated or ineffectively treated diabetes can lead to cataracts, for instance. Regular exams, for which NOVA Pets Health Center has money-saving Wellness Plans available, can help you identify diseases such as diabetes before complications develop. Trauma to the eye, sustained from rough housing or fighting with another animal, is also a risk factor. Never leave your pet unsupervised in areas where they could encounter wild animals or other unleashed pets! These and other safety tips can help you keep your favorite furball not just free from harm, but free from cataracts and other diseases. Should you ever notice symptoms of cataracts such as blue, grey, or whitish coloring in your pet’s pupil, don’t hesitate to give NOVA Pets a call at (703) 378-9791. Unable to call, you may also email infor@novapets.com for questions or concerns. Ready to make an appointment? Check out www.novapetshealthcenter.com to request an appointment!